Description: Pure, Refined, or Light olive oil is actually a blend of virgin or extra virgin olive oils and sometimes even other oils such as canola oil. These are Olive Oils are often chemically processed and refined using acids, alkali, and heat to extract as much oil as possible from olive pulp left over after making virgin or extra virgin olive oil. Due to it's higher smoke point, refined olive oil is often used when frying as the taste is more subtle..
Health Benefits: While the refining process helps to improve this second pressings flavor, the chemical agents used in the refining process destroy much of its major health benefits. Description: Extra virgin, along with the standard virgin olive oil, is extracted directly from the olive fruit by grinding or pressing the olives. This method involves "cold-pressing" the olives in thermal conditions which preserves their natural taste. This method keeps the oil from losing its flavor when exposed to high temperatures. Extra virgin olive oil is unrefined and produced naturally without the use of any chemical processes or chemical agents. Health Benefits: High-quality extra virgin olive oil has well-researched anti-inflammatory compounds, antioxidants and numerous heart-healthy macro-nutrients. Extra virgin olive oil benefits include lowering rates of inflammation, heart disease, depression, dementia and obesity. Diets high in extra virgin olive oil are associated with “a lower incidence of atherosclerosis, cardiovascular disease, and certain types of cancer” according to the US National Library of Medicine. Olive oil contains phenol acids that have positive effects on certain physiological parameters, including plasma lipoproteins, damage from oxidization, inflammatory markers, platelet and cellular function, and antimicrobial activity. Health Benefits: In olden times, cloves were used to relieve toothaches. In Indian Ayurveda, cloves are believes to alleviate stomach ulcers, indigestion. Origin: Found in spice islands of Indonesia, India, West Indies, Sri Lanka, and tropical parts of Africa. See Dr. Weil's site on cooking with cloves. Description: Palm oil is a type of edible vegetable oil that is derived from the palm fruit, grown on the African oil palm tree. Oil palms are originally from Western Africa, but can flourish wherever heat and rainfall are abundant. Today, palm oil is grown throughout Africa, Asia, North America, and South America, with 85% of all palm oil globally produced and exported from Indonesia and Malaysia; but most of the time not using sustainable measures. Origin: Native to the mountain regions of Sri Lanka, Thailand, Guatemala, and India. Description: There are about 100 varieties of vanilla, which is a member of the orchid genus, the most important being V. planifolia. The beans are long capsules that hang in clusters from the flower, and it is only when cured that they give their true vanilla flavor. Vanilla extract and bean is most often used in baking or sweet dishes. Health Benefits: The Aztecs believed that vanilla could treat intestinal gas and fever. Origin: Indigenous to the southeast of Mexico and parts of Central America, thanks to the well-drained soils from the surrounding tropical vegetation. More Information: Be wary of artificial or imitation vanilla, which is made from the waste sulphite liqueur of paper mills, coal tar extracts, or eugenol. See Dr. Weil's website on cooking with vanilla. Description: Coconut oil is made by pressing the fat from the white “meat” inside the giant nut. Health Benefits: Cumin is often used as a cough-suppressing agent and is great for digestion. Origin: Found in India, Iran, Indonesia, China, and the South Mediterranean. More Information: See Dr. Weil's websites on cooking with cumin. Description: vegetable oil is a triglyceride extracted from a plant. The term "vegetable oil" can be narrowly defined as referring only to plant oils that are liquid at room temperature, or broadly defined without regard to a substance's state of matter at a given temperature. For this reason, vegetable oils that are solid at room temperature are sometimes called vegetable fats. In contrast to these triglycerides, vegetable waxes lack glycerin in their structure. Although many plant parts may yield oil, in commercial practice, oil is extracted primarily from seeds. Health Benefits: Mace is used to treat indigestion and to relieve some joint pain, and it also can be a breath freshener. Origin: Native to the Spice Islands of Indonesia. Description: Canola oil, or canola for short, is a vegetable oil derived from rapeseed that is low in erucic acid, as opposed to colza oil. There are both edible and industrial forms produced from the seed of any of several cultivars of rapeseed Brassicaceae family of plants, namely cultivars of Brassica napus L., Brassica rapa subsp. oleifera, syn. B. campestris L. or Brassica juncea, which are also referred to as "canola". Health Benefits: Nutmeg has anti-inflammatory properties and helps with indigestion and bad breath. More Information: See Dr. Weil's website on nutmeg. Description: Chilies are the fruits of plants belonging to the Capsicum genus. The "hotness" that comes from eating chilies is due to chemicals within the pod, known as capsaicinoids. There are many varieties of chilies, ranging from color to intensity. One of the hottest chilies, Bhut jolokia, comes from India. It goes without saying that chilies are used to give instant heat to any dish. Health Benefits: Red chili peppers are natural pain relievers, particularly with congestion. They also boost immunity and have a lot of cardiovascular benefits. Origin: Native to the Americas, but may also be found in India today. More Information: See Dr. Weil's website on cayenne peppers, a type of chili. Description: Peppercorns are berries that grown on a climbing vine of the Piperaceae family. Once picked, these berries shrivel and resemble the peppercorns we are familiar with. Whole dried peppercorns have a harsh, cutting flavor due to volatile oils, however this flavor dissipates once the peppercorns are ground. Often used to give dishes that extra bite, black peppercorns are the most widely used spiced today, the Malabar variety being the most popular in India. Health Benefits: Pepper helps with indigestion and has a wide variety of vitamins, including potassium and magnesium. According to research, when eaten with turmeric, black pepper and all of its health benefits are better absorbed. Origin: Native to southern India and the Americas. More Information: See Dr. Weil's website on pepper. Description: These beautiful onyx seeds come from the annual flowering, fruit-bearing plants of the Nigella genus. Within the fruit are numerous seeds. The seeds have a slight peppery, bitter, onion-like taste. 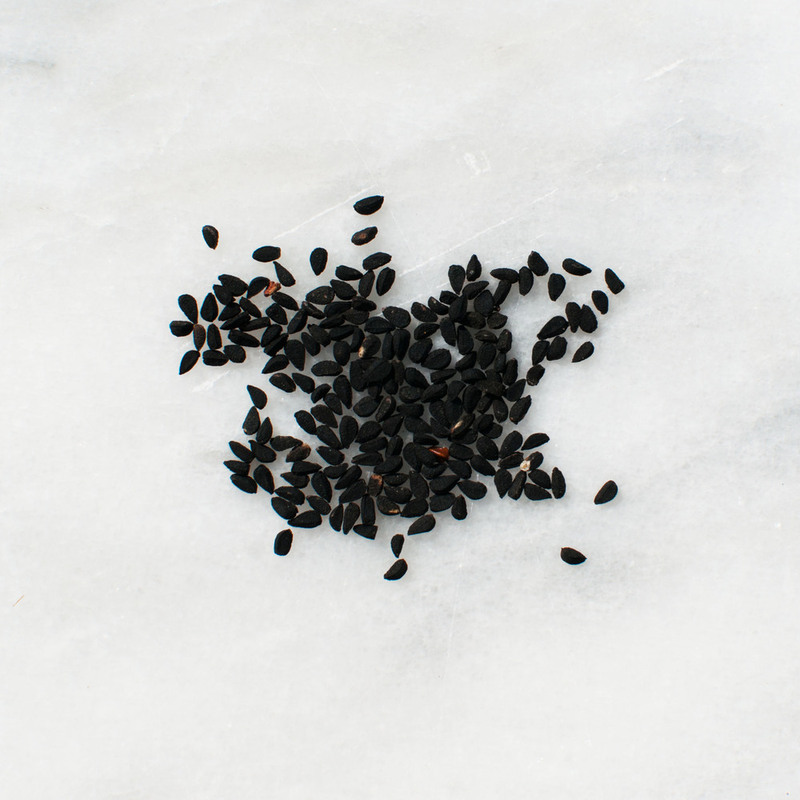 Nigella seeds are commonly used to flavor curries and to replace peppercorns. It is widely used in India for the spice mixture panch phoron, Bengali cuisine, and in naan. Origin: Native to south and southwest Asia. Description: Although it often has a nutty aroma, sesame oil is neutral in flavor. It's also got a middle-high smoke point, which makes it a strong choice for coating your fry pan or wok before plunking down meat or veggies. It carries a lot of vitamins, minerals, and fatty acids before cooking, so it does well in a salad dressing, especially one with an Asian flavor like ginger or orange. Smoked sesame oil tastes very nutty, as the heat releases more of the sesame. Use it for recipes where you want the sesame flavor to carry through. 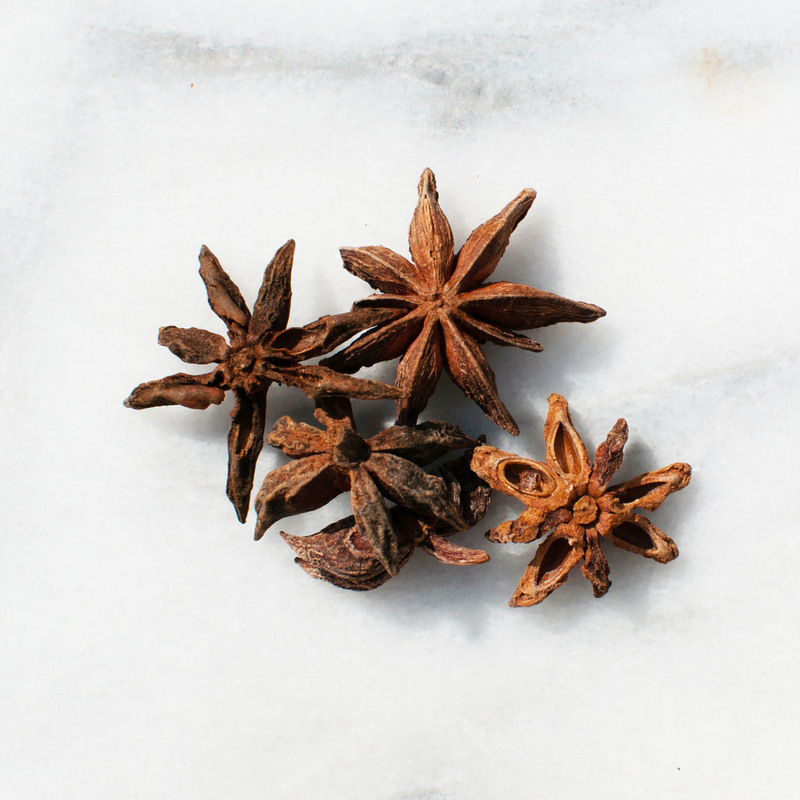 Health Benefits: Star anise is used as an indigestion remedy and as breath freshener. More Information: See the epicentre's website on star anise. More Information: Make May's Kashmiri Garam Masal an essential part of your spice cabinet by clicking here.